It’s been a while since I made homemade pasta. Good thing I have Daring Cooks to keep me in check. Our hostess Steph gave us this video to follow along as a guideline. My shape of choice was pappardelle. I used the recipe she provided as well (see below)…it’s s great basic pasta recipe. Along with my marinara and meatballs, this meal was thoroughly enjoyed by all. Mangia! And thanks to Daring Cooks for yet again another fun challenge. Sift the flour into a large mixing bowl. Push the flour out of the very center of the bowl, to make a ‘well’. Pour the beaten egg into the ‘well’. Slowly incorporate the flour into the egg by mixing a small amount of flour into the “well” at a time and mixing until incorporated. Start by mixing in flour around the perimeter of the egg, and gradually widening the mixing to include more and more flour. Mix until all of the egg is mixed into the flour. At this stage, use your hands to try to form a rough ball. If the dough is too dry, add a few drops of water and incorporate. Be careful to not add too much liquid – it’s better to slowly add water as needed, as opposed to trying to add more flour to a sticky dough. My trick is to wet my fingers, instead of pouring water directly into the dough. This ensures a minimal amount of water is added, and is more evenly distributed. Knead the dough for a few minutes, until it is smooth. Roll the dough into a ball, cover with plastic wrap, and set aside to rest. It should be allowed to rest for at least 15 minutes, at most 2 hours. Take this time to set up your pasta roller, and/or to prepare the sauce. Divide dough into 6 equal pieces. Take one piece to start, and put the remaining back into the plastic wrap so that they don’t dry out. Form the piece of dough into a ball, and then flatten using the palm of your hand. If using a rolling pin: Use a rolling pin to create a thin elongated oval. Place the dough horizontally on your work surface, and fold the long ends into the center, so that they meet. Press down on the edges to seal them. At this stage, you should have a rectangular shape. If using a rolling pin: Roll into a long, thin rectangle. Carefully flip the thin dough over, and dust with flour on both sides. Skip to step #15. Now run the dough through the roller two more times, again on the widest setting, without folding first. This will help to make the dough very smooth and elastic, for stretching. Now stretch the dough by running through the rollers, each time switching to a narrower setting. After the final setting, you should be able to see the outline of your hand through the dough. If using pasta rollers: Run the stretched dough through the fettuccine-sized cutters. Gently lay or hang your freshly cut pasta, and cover with a clean cloth so that it doesn’t dry out while you roll and cut the rest of your dough. OR, If using a rolling pin: Carefully roll the dough up (like rolling up a yoga mat). Choose how wide your noodle will be, and using a very sharp knife, cut through the rolled up dough. Unroll the noodles as you go, to prevent sticking. Repeat steps 8-15 for the remaining dough. Bring a large pot of water to a boil, gently drop in the freshly cut pasta, and cook for about 5 minutes. Drain and toss with sauce and enjoy immediately! Steph from Stephfood was our Daring Cooks July hostess. Steph challenged us to make homemade noodles without the help of a motorized pasta machine. She provided us with recipes for Spatzle and fresh egg pasta as well as a few delicious sauces to pair our noodles with! 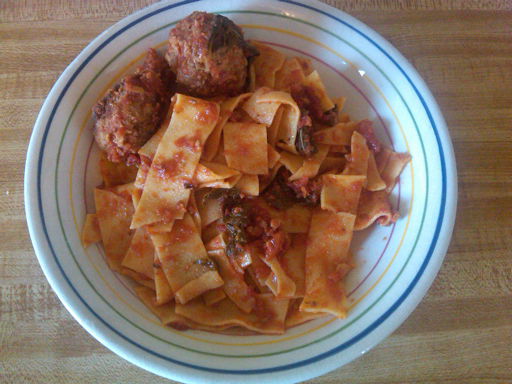 This entry was posted in Daring Cooks, Italian, main dishes, pasta. Bookmark the permalink. Great job on the challenge!! 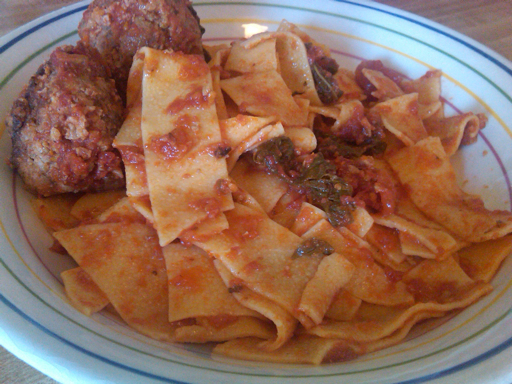 Looks great, and such a classic with the meatballs–sure to please everyone!! I love the wide noodles! It looks great. This is a great pasta dish! I love the width of the papardelle – definitely a noodle-lover’s pasta! Cheers! Great job with the challenge, I like your marinara and meatball pasta. Hello I just found your blog. Everything looks AMAZING. I think I might try to make this pasta on the week-end! Thank you so much for so much info on papperdelle! Oh, this dish with all those wonderful additions is looking like a perfect dish for me! Loved the picture!! SO super crazy cool! I haven’t made homemade pasta in a while either but I think it’s time. Yours looks perfect!